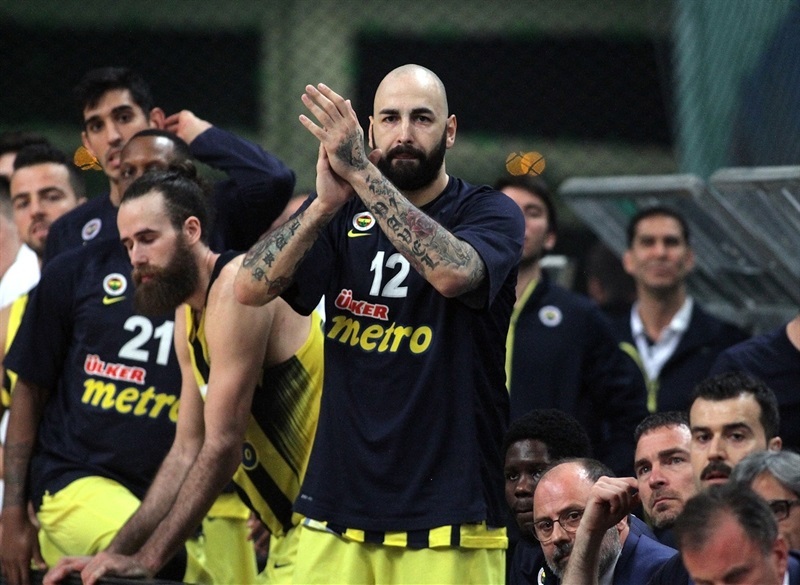 Fenerbahce Istanbul sent a message that echoed all around the competition by rallying from a 16-point second-half deficit to down Panathinaikos Superfoods Athens 58-71 in in front of a sellout crowd of 18,310 at the Olympic Sports Center Athens on Tuesday. 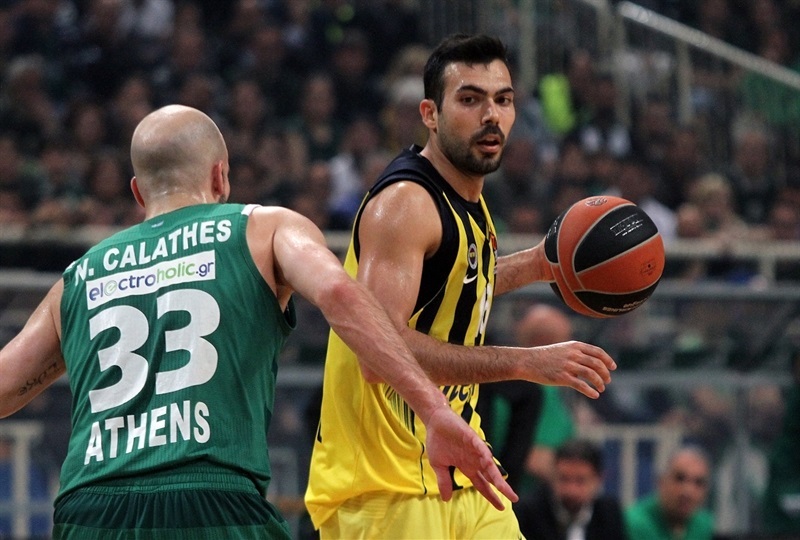 Fenerbahce has a 0-1 lead in the series, as Panathinaikos hosts Game 2 on Thursday. Bogdan Bogdanovic led the winners with 23 points on 5-of-6 three-point shots, five rebounds, four assists and a career-high three blocks. 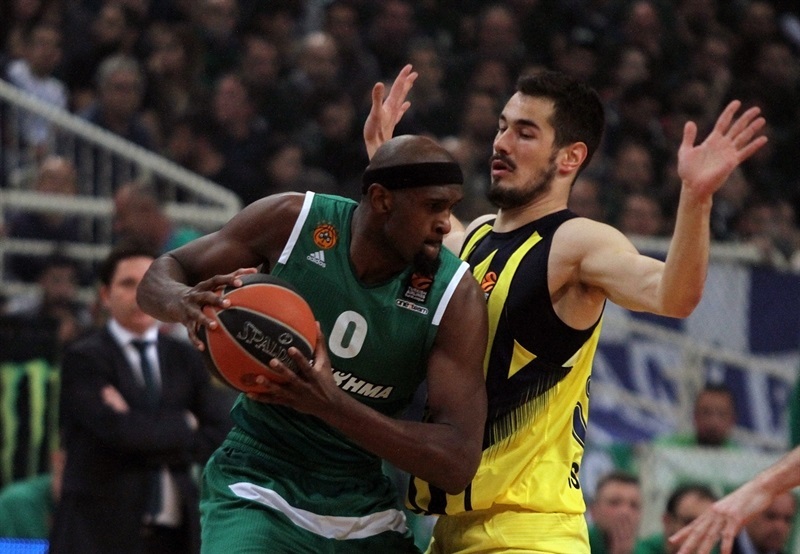 Nikola Kalinic added 16 points while Bobby Dixon had 13 for Fenerbahce. Bogdanovic had a PIR of 35, also a new career-high. K.C. 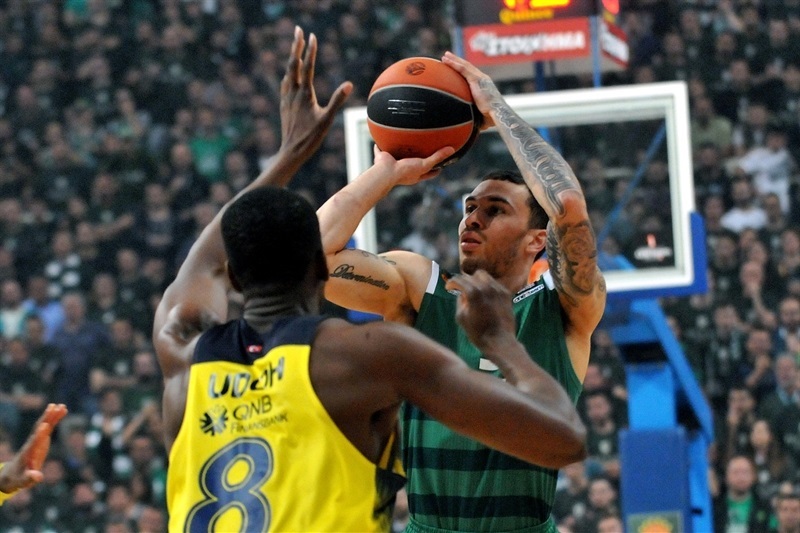 Rivers had 16 points to lead Panathinaikos while Mike James added 14. Fenerbahce had a great start and got a double-digit lead, 6-16, but James and Rivers fueled a 12-0 run that put Panathinaikos in charge. Both players kept pacing the Greens, which boosted their margin to 42-28 at halftime. Panathinaikos outrebounded Fenerbahce by 14-9 in the first half, dishing 10 assists and forcing the guests to pick up 10 turnovers. 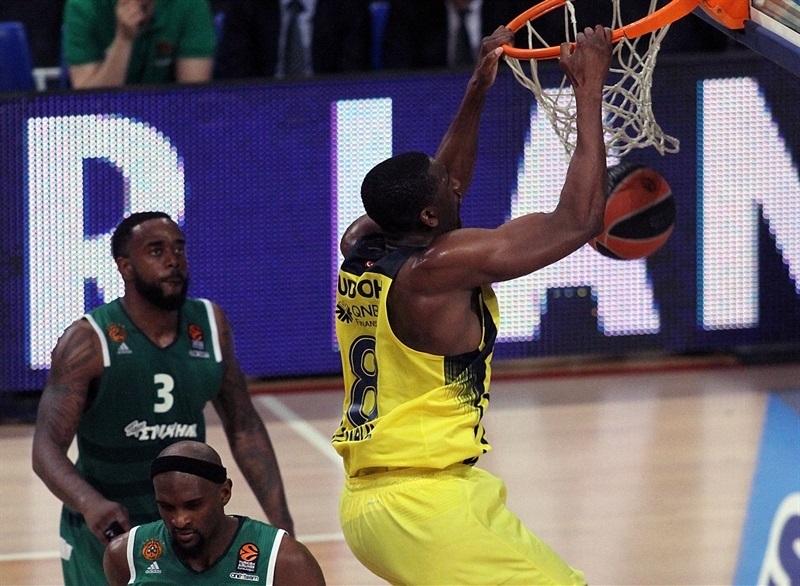 Everything changed after the break, however, as a mammoth 8-40 run allowed Fenerbahce to return to the game and even seal the outcome long before the final buzzer. 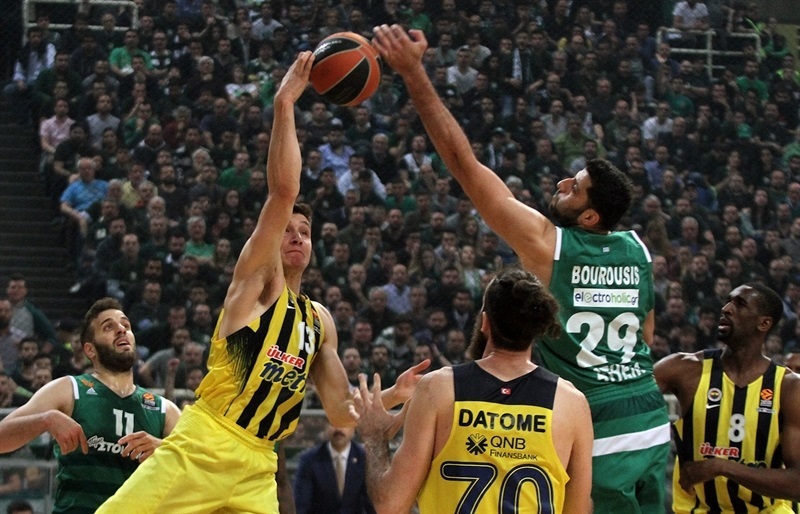 Fenerbahce limited its opponents to 16 second-half points - a new all-time low for Panathinaikos in a half. Fenerbahce ended up hitting 13-of-22 three-point shots (59.1%), in another big key for this critical win. Kalinic got Fenerbahce going with consecutive three-pointers, one from each corner, and Bogdanovic also struck from downtown for a 3-9 lead. Bogdanovic buried another triple and back-to-back alleyoop dunks by Vesely made it a double-digit game, 6-16. 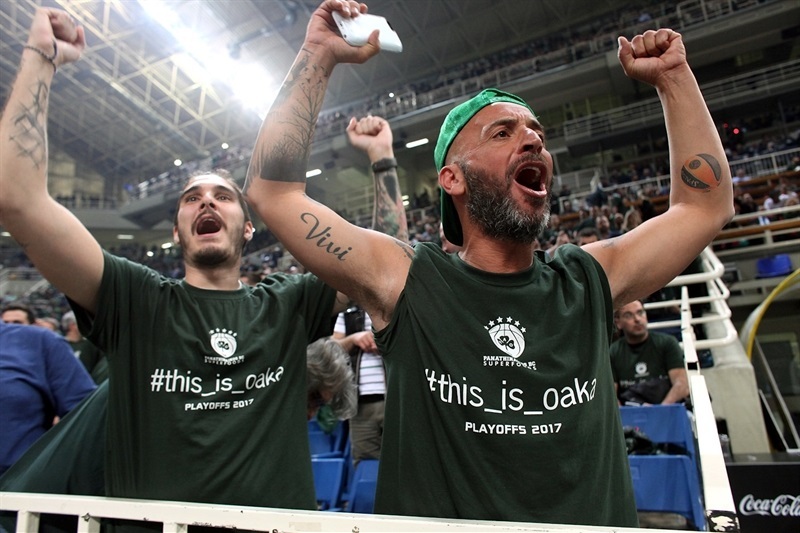 Nick Calathes stepped up with a driving layup, Ioannis Bourousis added free throws and fed Rivers for a three-pointer that brought Panathinaikos within 15-16 after 10 minutes. James buried one from beyond the arc to give the hosts their first lead, 18-16, after a 12-0 run. 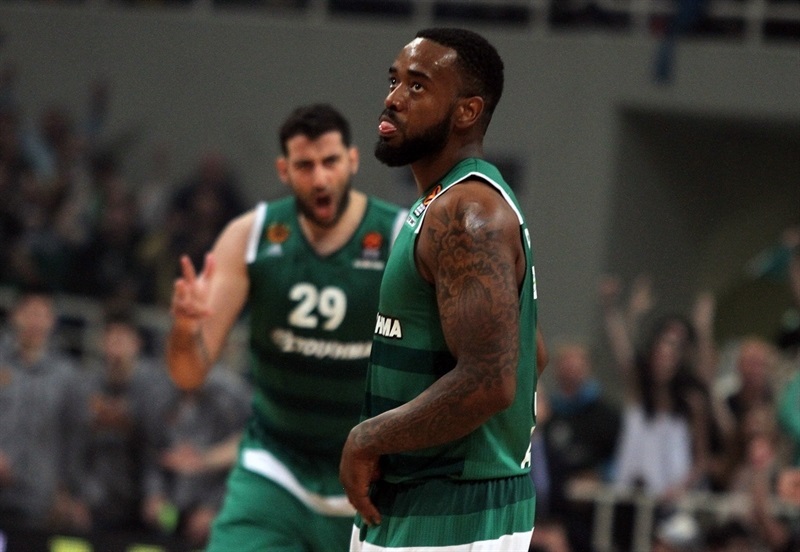 Ekpe Udoh and Dixon tried to change things for Fenerbahce but Nikos Pappas followed a driving layup with a floater for a 25-23 Panathinaikos edge. Rivers kept pacing his team with a rainbow jumper and a three-pointer, Kenny Gabriel also struck from downtown and James dunked off the baseline for a 35-23 Panathinaikos lead. Luigi Datome and Udoh stepped up for the guests but Rivers and an unstoppable James boosted the Greens' lead to 42-28 at halftime. Bogdanovic buried a three-pointer soon after the break, getting help from Vesely and Dixon to bring Fenerbahce within single digits, 47-38. Rivers nailed a jumper but a red hot Bogdanovic fired in two from beyond the arc and Vesely dunked again to make it a three-point game, 49-46. 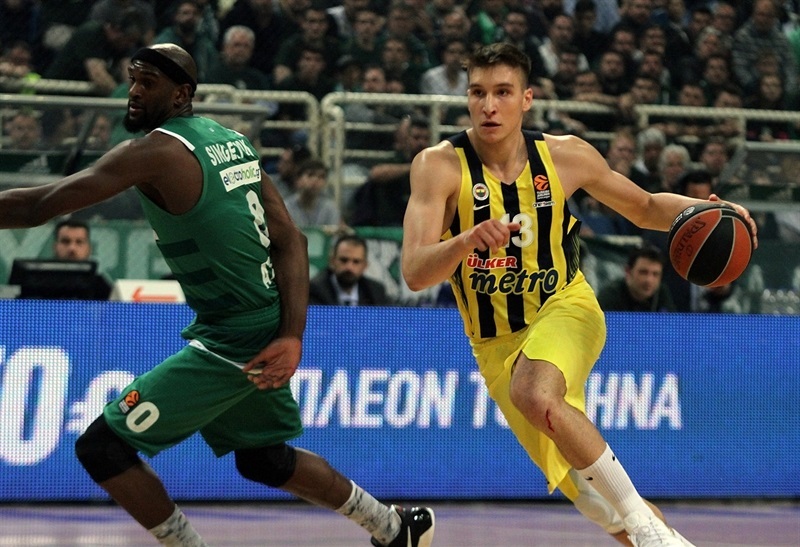 Bogdanovic brought Fenerbahce even closer, 50-48, after 30 minutes. 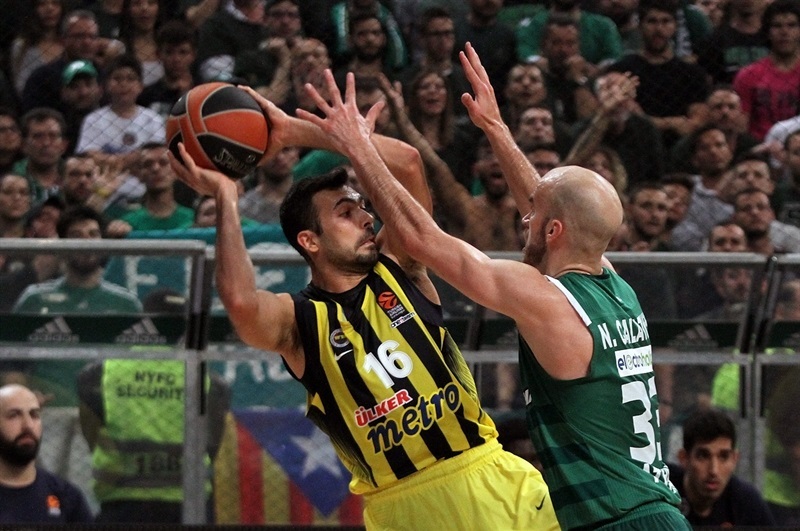 Kalinic followed a dunk with a three-pointer to complete his team's comeback, 50-53, early in the fourth quarter. Bogdanovic hit a jumper and Dixon swished a three-pointer for a 53-58 score with under 6 minutes left. 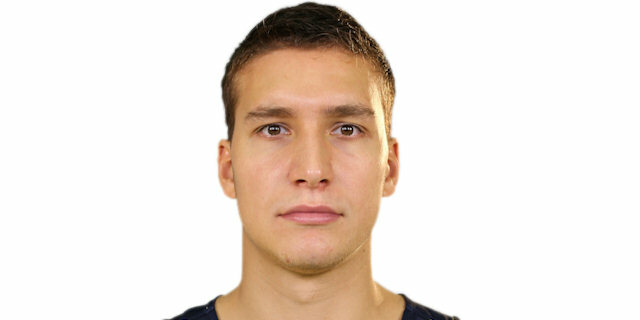 Bogdanovic - who else? - sank a jumper and a huge dunk by Udoh made Panathinaikos call timeout at 53-62. 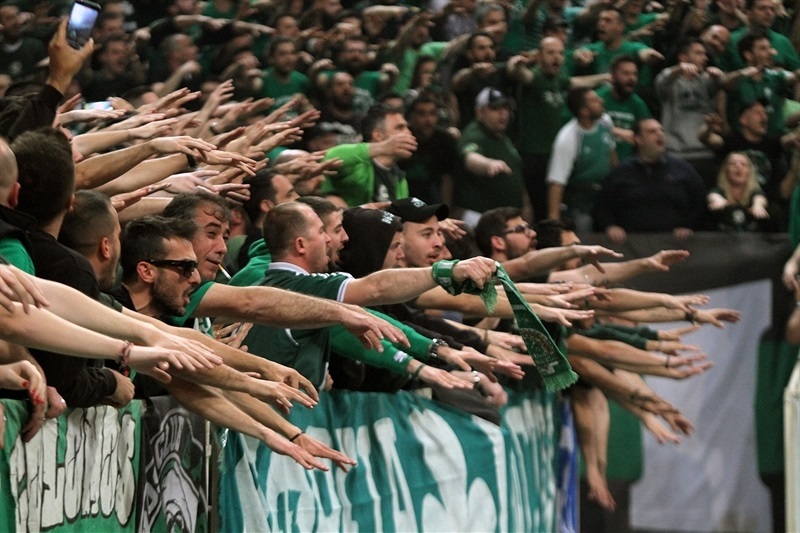 Kalinic followed free throws with a three-pointer and Dixon added a jumper that sealed the outcome, 55-69, as Panathinaikos never recovered. "First of all, thank you to our fans for coming here to help us. I think it is very clear - we played normal basketball for 20 minutes. We didn't play well the first 5 minutes, started the game nervous, without good defense or good offense. After 6-12, we changed and had control of the game, played better at both ends, more or less until the 24th minute. After that, we lost control of everything - defense, offense... everything started with offense, because we played very bad. Fenerbahce scored 11 points on fast breaks and changed the game because of our bad offense, clearly. This is why we lost. The best team doesn't win the playoffs, but the team which is mentally stronger. 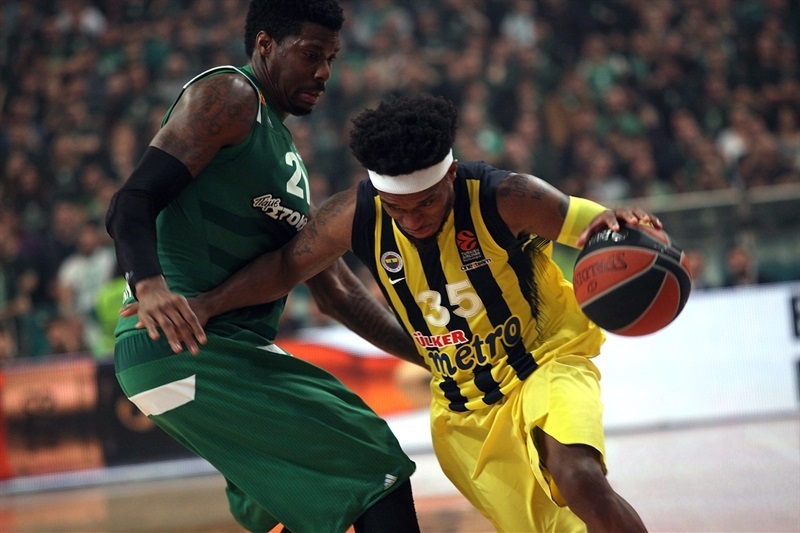 Fenerbahce was mentally stronger than us - when it was down by 16, it believed it could win. When Fenerbahce started to recover, we stopped playing and didn't follow our rules on defense. We lost control of our emotions and this is why we lost. Fenerbahce was confident and hit every shot while we lost our confidence and were not able to get organized on offense. We know that we have a new opportunity on Thursday. We have to prepare the game well, get ready mentally. This is just 1-0 and whoever wants to win the series needs three wins. We will try to play good games and if we do, we will have our chances to win." 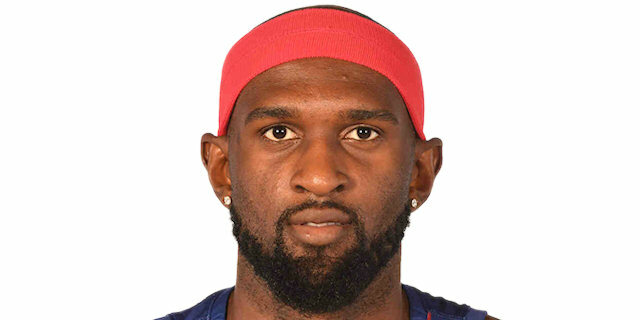 "Playoffs games are always very tough, very difficult - and especially for me, of course. This is something that I never wanted to happen, to play a playoffs series against Panathinaikos, something very emotional for me. 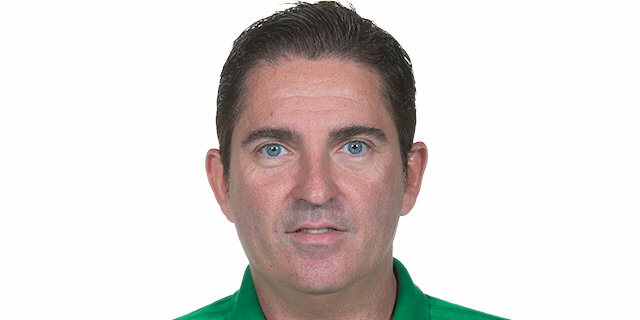 One more time, I want to thank all the people of Panathinaikos for how they received me. About the game, it is obvious that our second quarter was very, very bad. We turned the ball over very easily, 10 in the first half, and didn't try to play defense. The situation without any [committed] fouls while Panathinaikos scored very easy shots. This is what I talked about with my players at halftime, in the locker room. I told them it was better to go outside and be aggressive. We changed the game with our aggressiveness on defense, because they scored 16 points in the second half - this is not normal, of course, with the quality they have, but this happens in some games. The way we played defense gave us confidence to play better on offense, also. We scored some easy baskets in transition, started to go inside and one more time, thanks to our aggressiveness, we changed the game. We have enough experience to understand this is just the first game. 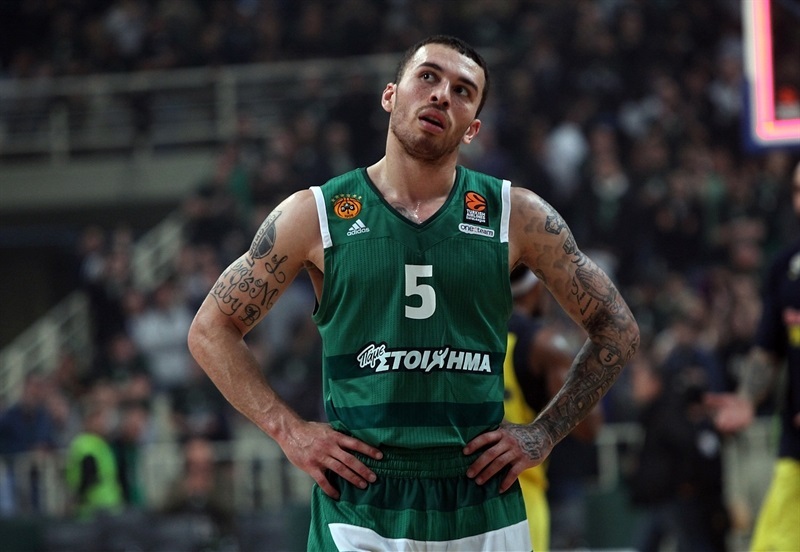 We know it will be tough for us and Panathinaikos, this result doesn't change anything because if you want to go to the Final Four, you must get three wins. I insist, it will not be easy for us and for them. I expect a very difficult and tough game for us again on Thursday." "They came out in the second half and made shots. They ran the offense well in the second half and played together. We just buckled. We crashed in the second half, tried to go a lot on one-on-ones and didn't play together. We settled for last-second shots and they got the rebounds." "We played excellent on defense and everyone contributed on offense, scoring some easy baskets in transition. This is just one game. This is a best-of-five playoffs series to advance to the Final Four. Nothing is over - we need to fight the same way in two days. 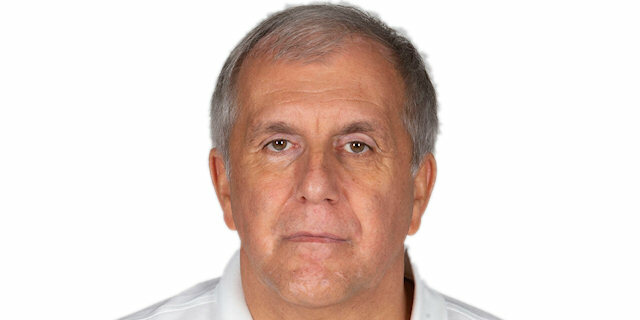 A couple of weeks ago, in an EuroLeague interview, I said we are unpredictable when we have a full roster. We have so many advantages and showed it in the second half today. Like I said, we reached our first goal today and the next one is in two days."